I wanted to write about self-esteem because I think we often only look at it from one angle. However, I find that for myself that self-esteem issues tend to be isolated in certain spheres or areas of our lives. I like to look at things from a holistic point of view. So I thought, why not address self-esteem in the same way. I hope others can find this holistic approach to self-esteem issues as helpful as it was for me to write this post. When thinking about how to approach this holistically I realized that self-esteem (like most other things) are about finding balance between several integral areas of human life, which I think correspond to the 7 chakra or energy centers. Below I explore self-esteem through the lens of the 7 chakras. I share the balanced and imbalanced state, and I find that most people can alternate and shift in our balance of all 7 centers (sometimes multiple times in a day). You may find some are well balanced while 2 or 3 are way off. The important thing is to notice when we are out of balance and work through the underlying causes of those imbalances. 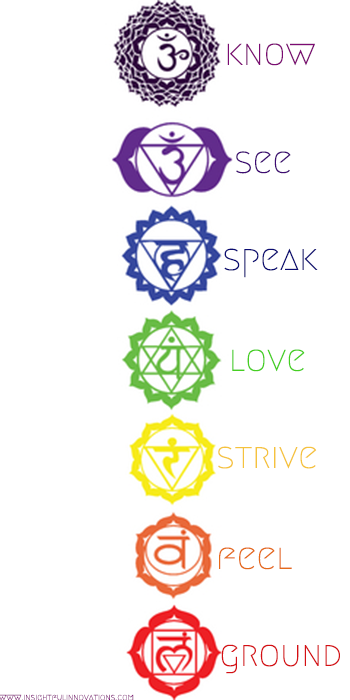 This chakra corresponds to our ability to care for ourselves and our physical and material well being. Body Location-The perenium/bottom of the spine. Balanced- If we are balanced in this sphere we may be confident about our ability to support ourselves, care for our bodies and setting physical boundaries in the material world. Imbalanced- If we are imbalanced in this sphere we may have trouble with our right to exist, our ability to care for ourselves physically or feel unsafe and violated by others frequently. We may neglect our nutrition or exercise. Alternately we may push ourselves and over-focus on the material reality (physical health, strength, the body, money, security) at the exclusion of the emotional or spiritual realities. This chakra corresponds to our ability to understand our emotions (particularly the "negative" ones like (anger, resentment, sadness and grief). The 2nd chakra is also our sexual center and corresponds to how we feel about ourselves as sexual beings. Balanced-If we are balanced in this sphere we may feel confident expressing our emotional truths to ourselves and others and feel comfortable and safe expressing our sensuality and creativity appropriately and freely. Imbalanced-If we are imbalanced in this sphere we may have little belief in our own sexual desirability or over-use seduction to meet our self-esteem needs. We may also have trouble expressing emotion out of shame or guilt or feel entitled to express our emotions in an unbounded, obtrusive or violating way. Many people struggle with self-esteem in this sphere. This chakra corresponds to our ability to take control, forge a path and achieve personal goals. Body Location-Above the navel, under the ribs. Balanced-If this sphere is balanced we will feel confident about our ability to make decisions and set goals. We will be unafraid to say yes (or no) and set boundaries. We will feel comfortable with acknowledging ourselves as powerful. Imbalanced-If we are imbalanced in this sphere we may feel like we cannot say no to others. We may feel an overwhelming need to please and feel a lack of confidence or seek permission in pursuing our goals. Alternately we may walk over others to meet our goals, and feel a sense of grandiosity and narcissism in gaining our happiness, whilst being pushy and domineering. This chakra corresponds to our ability to love and care for ourselves and others. Balanced-If this sphere is balanced we may have a healthy empathetic relationship to other people and society at large. We may feel open and receptive and willing to help others in need due to a recognition of love as a virtue. Imbalanced-If we are imbalanced in this sphere we may feel like we cannot identify with others struggle and pain. We may feel afraid of our own vulnerability and receptivity and become hardened to others. We may alternately feel too receptive and blown about by the trials and tribulations of others. We may be unavailable to offer assistance to others because we are over-identified with their pain. This chakra corresponds to our ability to express our truth to others and develop our creativity. Balanced-If this sphere is balanced we have the esteem to know that we can parse through truth and lies. We trust our ability to express our ideas and feel comfortable bringing new ideas to the table. We recognize that expression comes from a joy of continuing to learn about ourselves and others. Imbalanced-If we are imbalanced in this sphere we may have trouble expressing our thoughts, we may also become dogmatic and rigid in our intellectual understanding of the universe and closed to new information or interpretations. Alternately, we may be unable to sort through truth and lies and rely on others to tell us what to think and believe. This chakra corresponds to our ability to see clearly and trust our intuitive wisdom. Balanced-If this sphere is balanced we have the self-esteem to trust our intuition and guidance. We can see the truth and see through illusion. We can access the part of ourselves that knows what's best for us and can even entertain reality in different levels of awareness due to the healthy functioning our 3rd eye. Imbalanced-If we are imbalanced in this sphere we may not trust our intuitive guidance and look to others for direction. We may be closed to possibilities outside of our limited physical sight and feel a sense of doubt and anxiety about the future. Alternately, we may be too intuitively receptive and unable to filter out distortions, or so focused on our vision of the future that we become unyielding and inflexible. This chakra corresponds to our ability to sense and know the interrelatedness of all things. Balanced-If this sphere is balanced we have self-esteem about our place in the Universal scheme. We have developed our faculties of faith and trust in the perfection of the universe and know that all is well. Imbalanced-If we are imbalanced in the sphere we may doubt the relatedness of the universe and may have difficulty accessing faith in the present moment. We may feel abandoned, angry and alone due to a feeling of isolation in the universe. Conversely we may be ungrounded, and have a sense of spiritual mania and unwilling to participate in the physical world due to a devaluation of the material. Personally I find myself frequently working on my self-esteem in the lower 3 chakras and for all of us the heart (4th) seems to be a doorway into balancing the other centers. Where are your imbalances? What do you do to find self-esteem in these spheres?